Social media is the absolute best way to spread the word about your online fundraising campaign. Google Plus is growing bigger every day, so it is important to learn how to properly take advantage of this useful platform to raise money online. Get Your Google Plus Page Created! 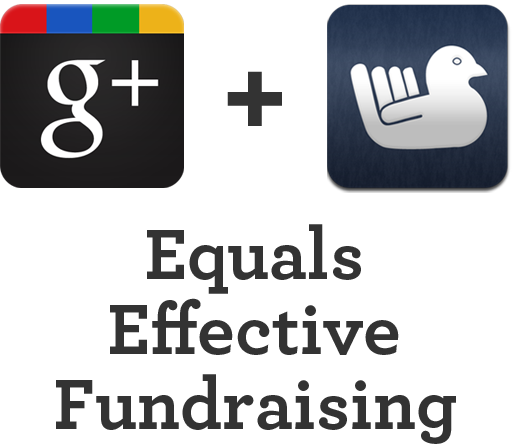 Since Google Plus is relatively new, we will begin by providing a tour of how to set up a Google Plus Page. Building it properly will make all the difference in the world. For example, consider how you setup your Facebook page. You filled in everything applicable to create a well-rounded profile, and this helped people find your page. The same thing is necessary for your Google Plus page. Make sure that you pay particular attention to your tagline, as this is a great way to capture attention and introduce your cause. By creating a great page, you will encourage more people to connect with it. There are two options on the edit page that you will want to pay close attention to: contributor and links. These areas actually allow you to let Google know that you are hosting an online fundraising campaign. Basically, in this scenario what happens is that Google picks up the links from your Google Plus page and adds them to the Google search engine, just like they would with any links that you place on a website. This functionality will increase the visibility of your fundraiser, and this will encourage more people to donate online. Your profile page will give you the option to enable Google +1. This creates a button similar to Facebook’s like button. For example, the +1 button will show up next to your page’s listing in Google’s search engine results. When someone clicks it, your fundraising page will be more easily accessible by the people in that person’s circle. Even if you are just learning how to fundraise, it is easy to see how beneficial the Google +1 button can be. Make sure you enable it so that others will spread the word about your fundraising ideas. Google utilizes an events function that is similar to Facebook’s. DonationTo definitely advocates using these events, as they will reach a much wider audience. Consider for example how much more likely you are to attend a friend’s birthday party if you receive a Facebook event invitation with all of the necessary information. The same thing is true of Google’s events. Also, just like Facebook, it is estimated that only 12 percent of the people in your circle see your actual posts. By sending an event invitation about your fundraiser, everyone will receive the important information, and more people will remember to donate online. Creating a Google event is a fantastic and simple way to spread the word about your cause, but it is not enough. If you truly want to raise money online for a good cause, then you need to use all of the tools that are provided by social media. Creating a Google Plus page for your fundraiser is the perfect way to raise awareness. Consider for example the popularity of Facebook fan pages, and how good of a job the best of them do at encouraging you to interact with them. Google Plus pages work the same way, and creating one is quickly become an introductory portion of learning how to fundraise. You will be able to utilize your fundraiser’s Google Plus page to communicate with people who are interested in your cause, and you can also share updates, photos and videos to encourage donations. In order to fully promote your cause, you need to ensure that there is nothing in your google privacy settings that is blocking people from seeing your content. For example, consider what it looks like when you try to visit someone’s Facebook page and they have all of their information set to friends only. If you cannot easily access information, you will quickly move on. The same thing is true of your potential donors. Make sure that they can see all of the information that you are sharing about your fundraiser. Share your passion for the project with the world, and the donations will follow. Adding some style to your status updates will help capture attention. Case in point, almost all Internet users are more likely to actually read something if bold or italics has been used in the formatting. This is a simple matter of making something stand out in order to be noticed, and it has been used by marketing agencies since the creation of advertising. Google Plus allows you to create a bold status update by putting asterisks around it, like so: *Please support this great cause by donating online today. * You can place an underscore in place of each of the asterisks for italics. Utilizing this approach will ensure that your fundraising ideas stand out, and more people will pay attention to your message. Images are an important way to introduce your fundraiser. Consider for example how much more likely you are to click on something if it is accompanied by an eye-catching image. Google Plus enables you to publish a cover image and a profile image. You can use both to introduce yourself and your fundraiser to the world. By seeing these images, people will feel more compelled to learn more. Google Plus is a necessary component of social media marketing, and it can help you reach a new group of potential donors. Take the necessary steps to properly set up your page, and make sure that you send out an event invitation to all of the people in your circle. Use status update formatting to grab extra attention, and publish photos that will help people become more interested in learning about your fundraiser. Sharing your cause on Google + can easily increase people awareness and potentially influence the success of the crowdfunding campaign. Only on this donation website one can know how to crowd fund with social networks.